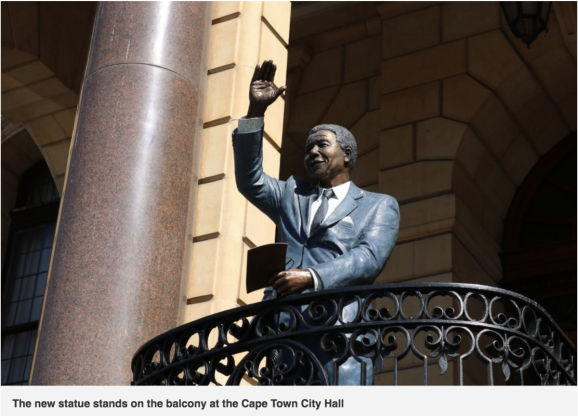 To celebrate the centenary of Nelson Mandela’s birth, a statue of the great man now stands proudly on the balcony of the Cape Town City Hall, where he gave his first public address as a free man on 11 February 1990. And now, visitors can relive that historic moment on a free City Sightseeing walking tour. Madiba electrified a crowd of more than 50 000 that had gathered on the Grand Parade that sunny day, to witness history in the making as the country took a pivotal step on its long walk to freedom. To capture the essence of that spine-tingling day of hope and celebration, artists Xhanti Mpakama and Barry Jackson were commissioned to create a sculpture to be positioned on the very City Hall balcony where Mandela spoke for the first time in public after being in jail for 27 years. The life-sized bronze statue depicts him waving to the cheering crowds below. City Sightseeing is proud to be showing visitors and guests this important monument to our democracy as part of our daily sightseeing tour of Cape Town’s historic places. Every day at 10.30am, 12pm, 1.30pm, 3pm and 4pm, we offer free walking tours from our offices, at 81 Long Street. Simply look out for the guides with their bright red umbrellas to join a tour. Learn more about our free walking tours here. Click here for more information about all City Sightseeing's packages or to buy tickets.